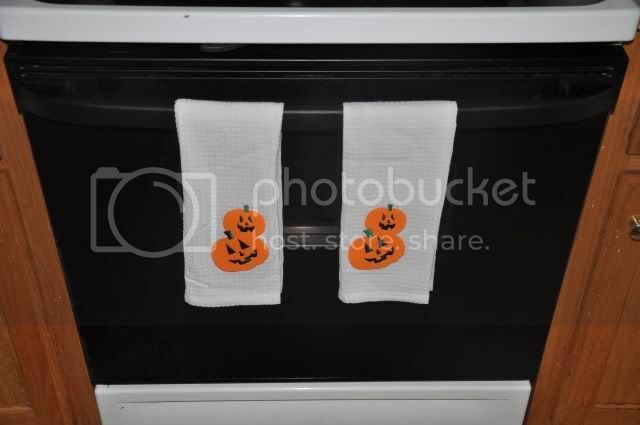 I got the fabric pumpkins at Target for $2.50. My niece brought the small pumpkins over with stickers for the kids. Little Bit tore all her stickers off. I keep finding them all over the house. 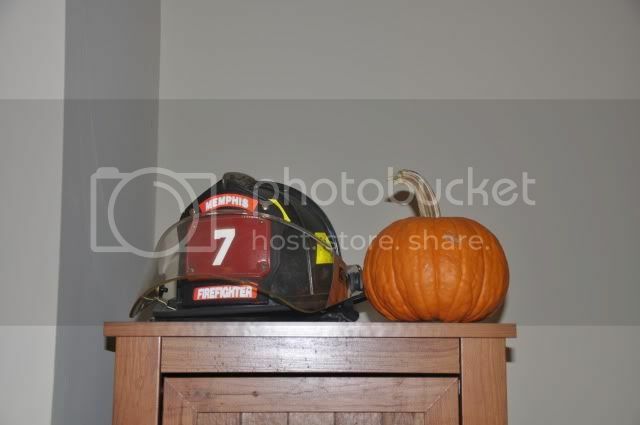 This pumpkin was purchased when we visited a local pumpkin patch. We bought two pumpkins and hayride tickets for $9. 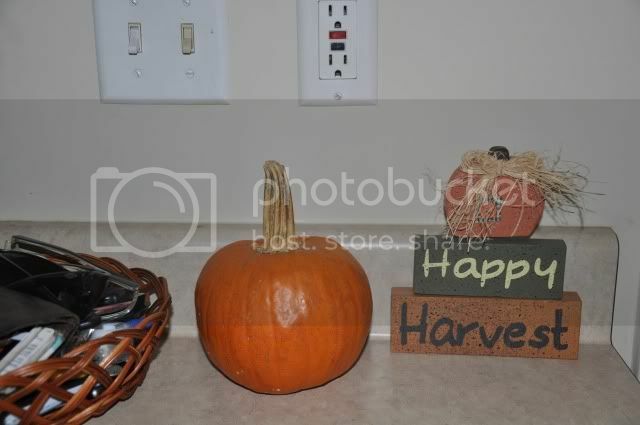 I found the Happy Harvest sign at Hobby Lobby for $4.99. It was on sale for half off. I picked this banner up at Target. It's hanging above the windows in our kitchen. I don't remember how much I paid for it, but it was inexpensive. I bought window clings at Dollar Tree. I bought three pages for $3. These are also in the kitchen. 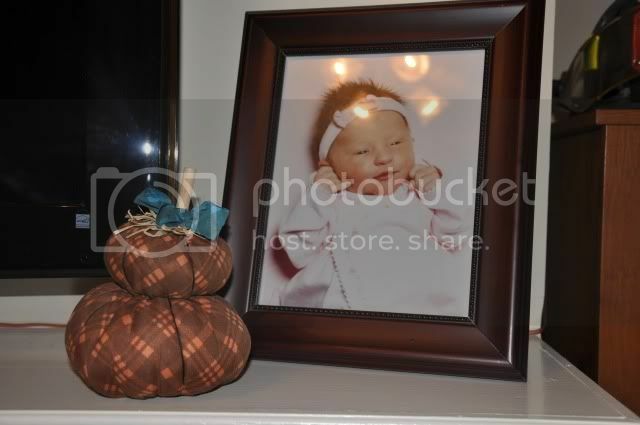 This is our mantle in the living room. I didn't have a lot of space to work with since our flat screen sits up there. 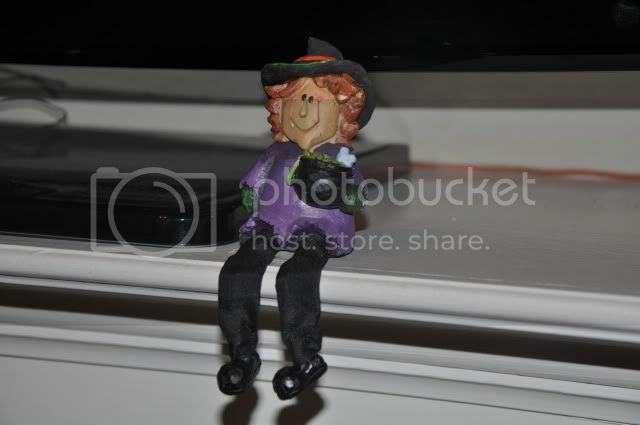 Miss Witchypants was $1 at Dollar Tree. Mr. Frankenstein Face was also $1. Here's the other set of fabric pumpkins I grabbed at Target for $2.50. 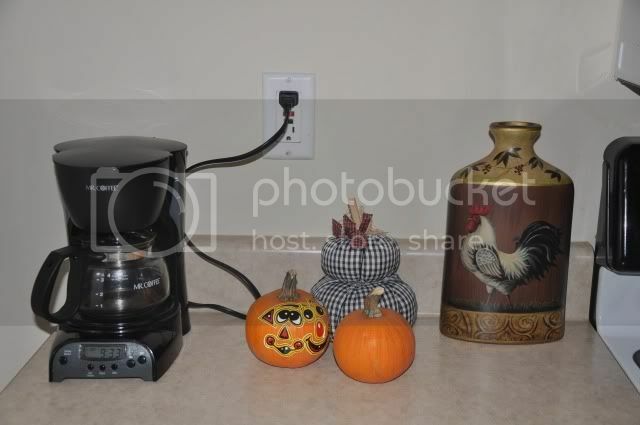 This is the other pumpkin we purchased at the pumpkin patch. 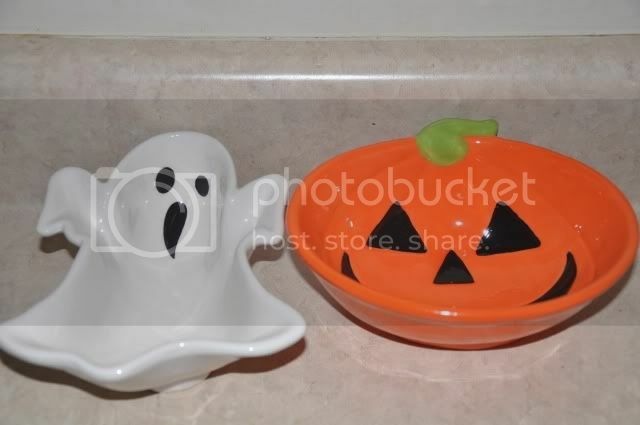 These candy dishes were in the dollar bins at Target. Score! These towels were also in the dollar bins at Target. They came as a set. Little Bit takes them down all the time. I find them in the oddest places. Can I just say how much I love the dollar bins at Target? 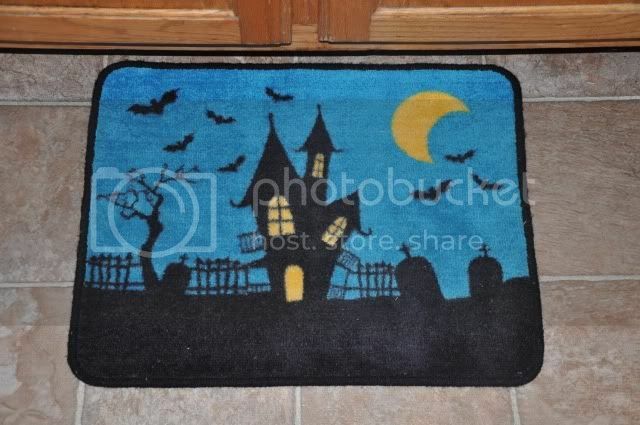 This cute Halloween rug was also only ONE DOLLAR. Little Bit runs off with this too. 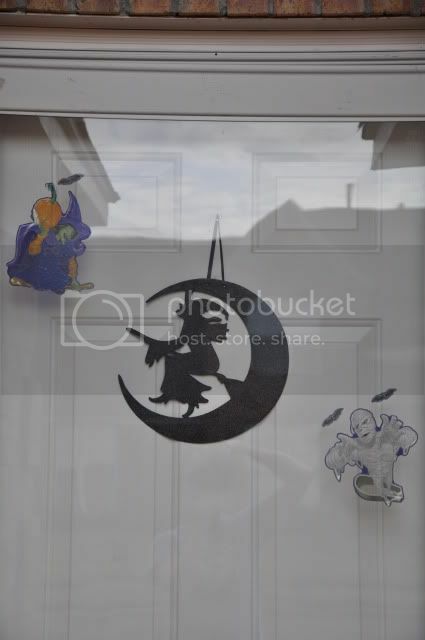 This is our front door. The witch was $4.99 at Target. When I turn the outside light on at night, she kind of glows because she's glittery. 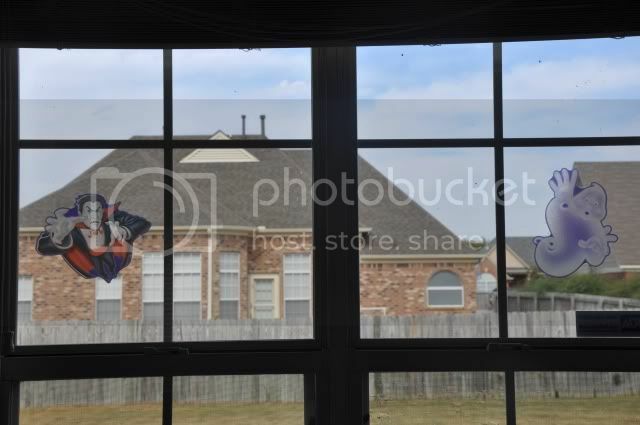 I also put a couple of window clings up there to keep her company. 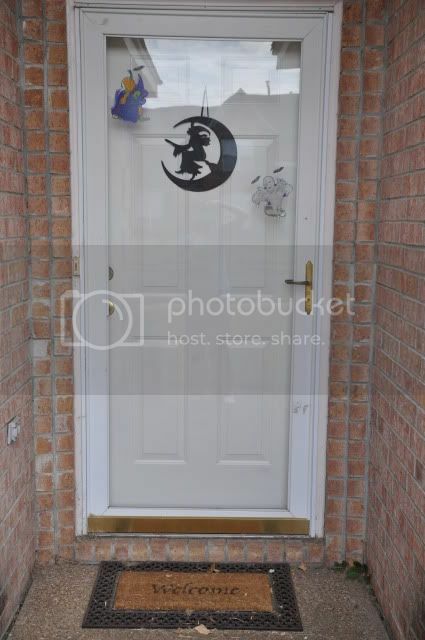 So that is how I decorated my house for Halloween on a budget. I think it turned out pretty good... simple, but nice. Now, I'm off to clean my dirty house so I can get ready for Little Man's birthday party tomorrow. I'm expecting 33 people. Please pray for me. You did a great job!! I think it all looks great! And WHAT...$1 bin at Target??? Maybe Hawaii doesn't have that particular bin at our local Target, but I will be sure to bug the nice people there about it!!! It looks great! I only did outside our house.... I am bad like that, I save it all for Christmas. As I was unloading the fall/Halloween totes, I was told that Halloween is scary but my stuff was not scary. She wanted me to go buy scary stuff right then. 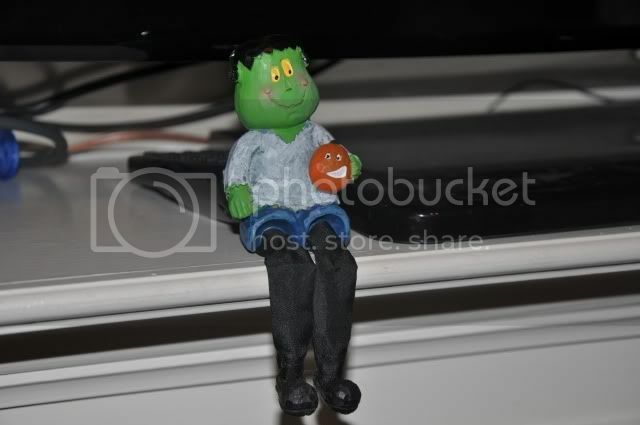 We have the same Mr. Frankenstein. 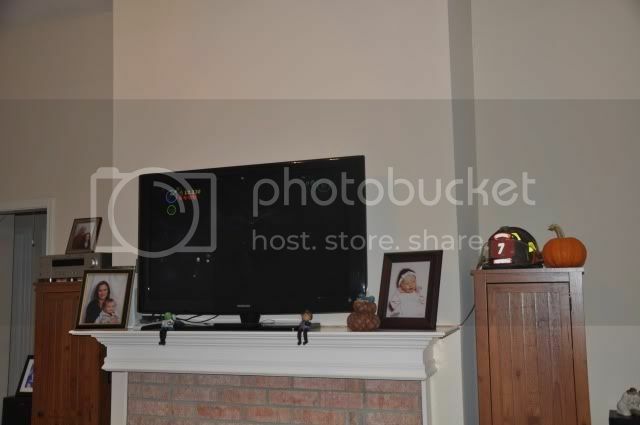 He sits on the overly large speaker in the living room. I love him! The dollar bins at Target are the best. things. ever. !!! Very cute! Oh wow, good job! It doesn't matter how much you pay for the decoration, the result is all that matters. And honestly, there are so many reasons for a special decor during the year that for some families, investing in all of these would be a serious waste of money. For some reason, though, I never seem to find nice items for a reasonable price. People who do must have a special talent for that. How do you do it? You've found some seriously cute stuff! I prefer holiday decorating on a budget. Since the stuff has to go into storage and only gets pulled out for a couple of weeks a year. Great job! 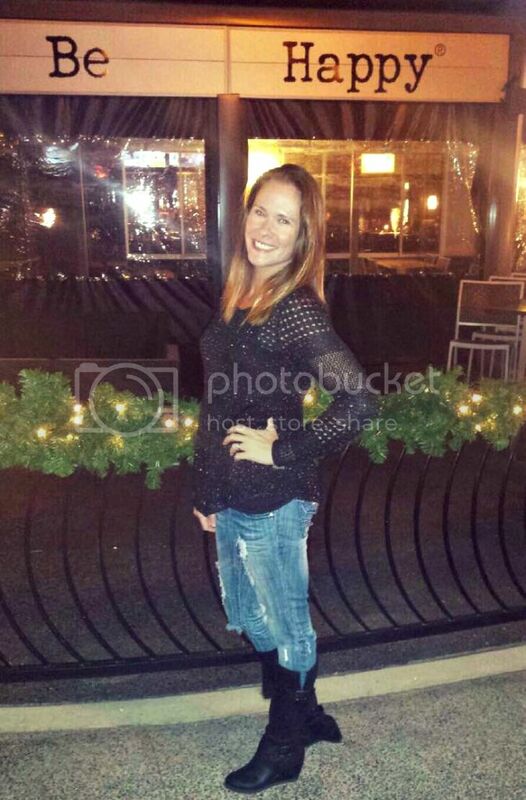 And, I'm sure your kids love it... Now, as far as those 33 people are concerned -- what were you thinking?!?1... Come visit when you get your sanity back! Great job! I love it. The Halloween rug is too cute. I need to get my tail over to Target later. I lurve the fabric pumpkins! Isn't Target wonderful. Actually, it really is kind of a dangerous place for me. You do have an expensive holiday season - yikes! I'm so lucky most of my family is spring birthdays. 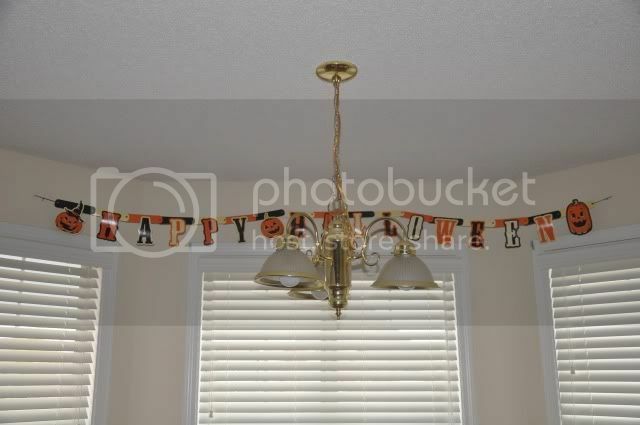 Great job decorating. Very festive! I LOVE Target. Especially the dollar bins. I buy something from there every single time I go. One, two, three, four... FIVE!